The following is a guest post by Jonathan Raymond, former superintendent of the Sacramento City Unified School District from 2009-2013. In a structure as rigid and hierarchical as the public school system, what is the most important role of a leader? Here’s my answer in a nutshell: Faced with a vertical org chart, great leaders cultivate relationships that are emotionally horizontal. In other words, leaders make themselves emotionally accessible to their colleagues by forging relationships through trust, communication, collaboration, and empathy. By their very nature, hierarchical org charts encourage top-down thinking: Unless you’re at the very bottom, there’s always someone beneath you. When I served as Sacramento’s Superintendent of Schools, the school board was “above” me, while the city’s school principals, administrators, staff, and teachers were “below.” Where were the children? Technically, I guess they were below the teachers. Where were families and the larger community? Technically, not there at all. What’s wrong with this picture? As I quickly learned, pretty much everything. Let’s start at the very lowest point on the chart: the children. Can public education fulfill its promise through a top-down process where the only role of the child is to absorb the impact of decisions made many rungs above them? Its founders didn’t think so. 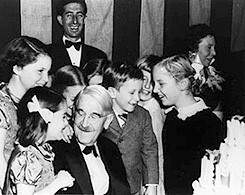 John Dewey, surrounded by children, celebrating his 90th birthday in 1949. For Dewey, the role of the teacher was not to issue orders, but to connect to an activity initiated independently by the child. Anything else he considered “pressure from without” – otherwise known as top-down mandates. Dewey and his fellow education reformers like Maria Montessori and Rudolph Steiner promoted collaborative and cooperative teaching methods. Teachers, they believed, should honor each child as an individual, behaving as mentors, with care and compassion. As superintendent, I found myself living out this model, first finding ways to develop close working relationships with our school board and listening to the voices of Sacramento’s children (and by extension their families) and centering our decisions around their needs. As I detailed in my recent book Wildflowers: A School Superintendent’s Challenge to America, the more I listened, the more obvious it became that a meaningful 21st century education requires reciprocity, a meeting of the minds between adults and children in an atmosphere of mutual respect. We can’t prepare our youth for the challenges of tomorrow by holding them at arm’s length, lecturing to them from afar, and excluding them from decisions affecting their education. Whole Child, Whole Family, and Whole Community education requires us to forge relationships built on humility, curiosity, and empathy. Start by listening. Similarly, the relationship between teachers and school administrators is rendered nonfunctional by rigid adherence to hierarchy. The chronic burn-out and disillusionment experienced by so many talented educators is not inevitable, nor can we blame it on the impoverished circumstances of the communities many of our best teachers serve. I know this to be true because – in the toughest test of leadership I ever faced – my district defied state and federal bureaucracies and essentially transformed our lowest performing schools into labs for Whole Child learning, known as the Superintendent’s Priority Schools. In many ways, the Priority Schools disrupted the education org chart. Not by sowing chaos, but by facilitating collaboration among teachers, authentic communication between teachers and administrators, individualized and caring relationships between educators and students, and active, equitable and authentic engagement and empowerment with parents and the community. What was the outcome? Both students and teachers flourished, with traditional metrics like graduation rates, attendance, and test scores rising (while discipline rates dropped) alongside self-reported improvements to enthusiasm and morale among both children and adults. The leadership lessons I learned in Sacramento continue to play out in my current role as president of the Stuart Foundation, dedicated to improving life outcomes for youth through education. Through the support of partners like Mills Teachers Scholars, the Center for Teaching Quality, Pivot Learning, the Buck Institute, and Envision Schools, Stuart elevates efforts to bring empathy, compassion, and real communication to every level of the education system. That’s the only type of leadership – humble, generous, and self-aware – that can truly transform public education in America. Once again, I know this through first-hand experience. Among the projects supported by the Stuart Foundation is California’s Labor Management Initiative, which promotes collaborative relationships between unions and public school administrators. While you might expect that building trust between traditional adversaries would improve the experience of teachers, principals, and district staff, there’s actually more to it. In forging positive ties between unions and district leadership, the Initiative has been found to improve student performance. Why are students more successful when labor and management reach across the table to connect? Because to view the school system solely through the lens of hierarchy is to rob everyone involved of their humanity, and the strengths that come when that humanity is celebrated, not stifled. Notably, our most cutting-edge industry has found that leaning into the strengths of our humanity – our ability to connect and empathize – is key to the jobs of today and tomorrow. When Google embarked on a massive research project aimed at determining how to build the perfect team, it found that “in the best teams, members listen to one another and show sensitivity to each other’s feelings and needs.” Or, as former Google Distinguished Engineer Yonatan Zunger puts it, “Essentially, engineering is all about cooperation, collaboration, and empathy for both your colleagues and your customers.” Be aggressive about ways to look to partner. Partnerships bring both excellence and equity. Want to be a leader in education? If so, you must know deep in your heart that modeling these traits for our children isn’t a “nice-to-have”: it is core to preparing them for 21st century work and life. Whether you’re a superintendent, administrator, a teacher, a parent, or community member, you can help lead the movement to reimagine public education as a path to success for all children – start by looking across not down. Take risks for kids, and encourage our young people, families, and communities to advocate for themselves, even if that means pushing back against us.